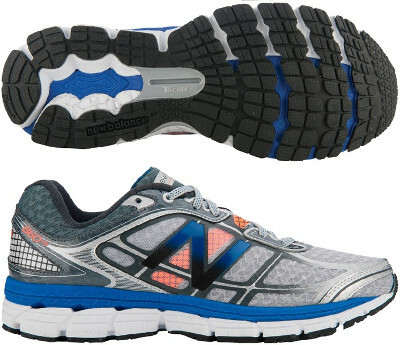 New Balance 860 v5 are stability cushioned running shoes. The New Balance 860 v5 features more motion control than stability and targets runners with moderate or severe pronation looking for good cushioning on long rides. This fifth version is lighter and unveils several changes from its predecessor the 860 v4. New asymmetrical heel counter for lower lateral support and the redesigned T-BEAM shank deliver torsional stability through the midfoot. Motion control relies on three separate foam densities building the 860 v5's midsole guiding feet forward. Upper has been redesigned to provide better fit than any other counterpart. It affects not only the soft air mesh combining synthetic and TPU film but also the mentioned above heel counter and lateral straps (now in orange!) that wrap the midfoot through the lacing system to improve fit and stability. Outsole has been reenginereed to provide the right amount of cushioning and flexibility while plenty of blown rubber to get good traction.